The earth is 4.54 billion years old. That’s a big number to wrap your head around. Spending time among very old things helps, but even then it’s easy to forget that not only the fossils themselves are ancient; so is the rock they came out of, the planet circling a sun that has been around a long time. Since my childhood, dinosaurs have arrested my imagination like nothing else in science, and what better place to witness the majesty of these ancient animals than the Houston Museum of Natural Science, displaying some of the oldest things on Earth? When I walk through the Morian Hall of Paleontology, I see the bones of creatures that lived millions of years ago, preserved naturally by the processes of geology, like mummies, but embalmed by mud, pressure, and minerals. These aren’t bones, really. They’re rocks, no different from petrified wood or the crystals in the Cullen Hall of Gems and Minerals. They were once creatures of flesh and bone, but the organic molecules and chemicals that made up their bodies, if they didn’t decay, were replaced atom by atom while the rest of life on Earth developed. Lane, the most complete fossil specimen of Triceratops in the world. 65 million years old. Mine is a problem of scope, I think. It’s a strange feeling to understand that Lane the Triceratops, the most complete specimen of this dinosaur, was under our feet during the fall of the Roman Empire, was still buried in the time of King Tutanhkamen, and remained undiscovered while Shakespeare wrote his sonnets. This animal died, and life went on as it always does. Its life among presumably millions of others like it was common. Undistinguished. But that specimen is no longer a Triceratops; it’s a skeleton made of rock. Not even a skeleton, but an impression of it. A three-dimensional photograph dug out of the album that is the many-layered dirt of our planet. This animal has become a symbol of history. Now that is rare. Icthyosaurus mother. At least 146 million years old. It’s remarkable, this action of preservation that the Earth is capable of. And it’s remarkable that we have developed the science to identify and understand these stones. We had to consider both the life cycle of rock and the taxonomy of life before we could begin to speculate what these samples could mean. But really, so what? They’re just rocks. It’s the feeling of humility they deliver that makes them fascinating. It’s like walking through modern Rome after living in developing Houston, surrounded by buildings a thousand years old that stood before the United States was even imagined. We’ve been walking around these seven continents for millenia, in the dark about what was under our feet until the birth of paleontology in 1666, when Nicholas Steno identified “tongue stones,” known then only as triangular rocks, as fossilized shark teeth. Dinosaurs were around whether we knew they existed or not. They are as old as the rock we walk on. Impressions of Icthyosaurus pups in the rib cage of this rare specimen suggest this animal died in childbirth. Now consider this. In 2011, biologists identified 20,000 new species, a large number of them beetles, and most of them invertabrates. That was in a single year. Now take that diversity and multiply it by the age of the Earth. I’m not going to do the math, but that’s the number of species paleontologists have yet to discover. That’s the amount of life we potentially have yet to search for in the rock. After early hominids, fossils of the first humans date back 1.8 million years, along with mammoths, mastodons, and saber-toothed cats that appear in the rock alongside them. 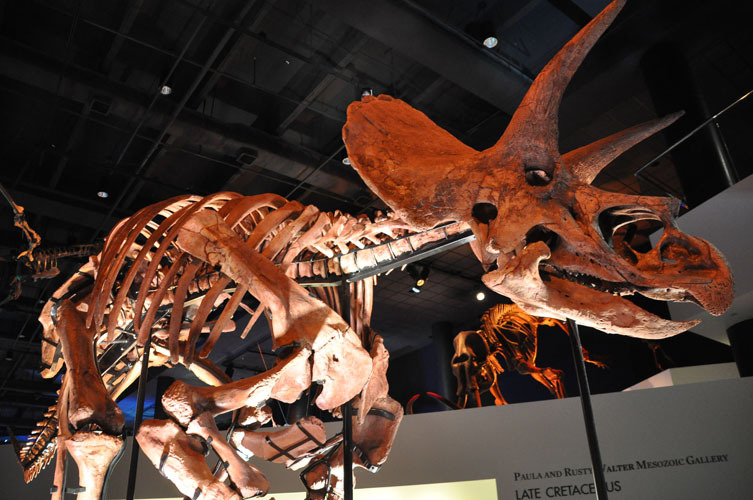 Triceratops lived in the late Cretaceous, discovered in rock at least 65 million years old. Icthyosaurus swam the oceans and gave birth to her young between 245 and 146 million years ago, in the Jurassic and the Triassic. (Their era lasted 100 million years. Again, we’ve been around for 1.8.) Trilobites in our collection have been preserved for between 540 and 360 million years, and the stromatolites, layered rocks formed by ancient bacteria, date back to 3.4 billion years. Not million. Billion. They appeared in the Archaeozoic Eon, about a billion years after Earth solidified out of molten space-rock. One of the best preserved and most intricate trilobites in the world. At least 360 million years old. What will the occupants of this planet find after the next million years? 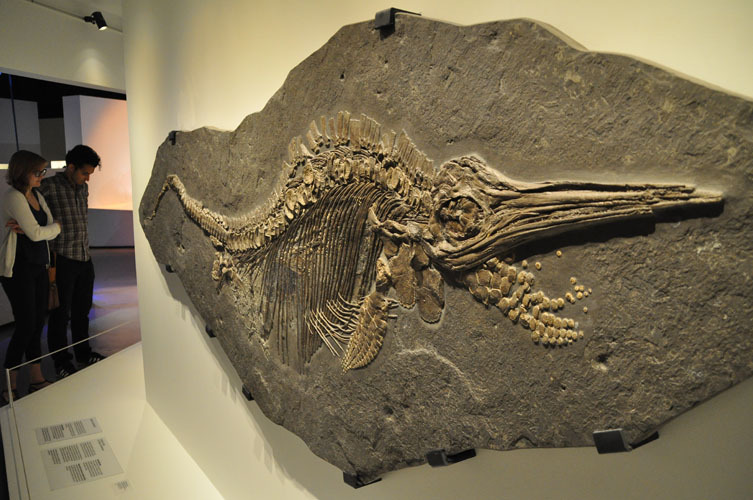 We’ve been around for a while, but not nearly as long as these fossils. What will paleontologists of the future, if they still exist, find in another 65 million years? 146? 540? 3.4 billion? The Earth will still be here by then; humanity is another story. Will we still cling to the crags in a different form, the maps unrecognizeable to the once-dominant species of 2015 CE, if they could see them? Will we have preserved our history as well as the rocks have preserved the dinosaurs? 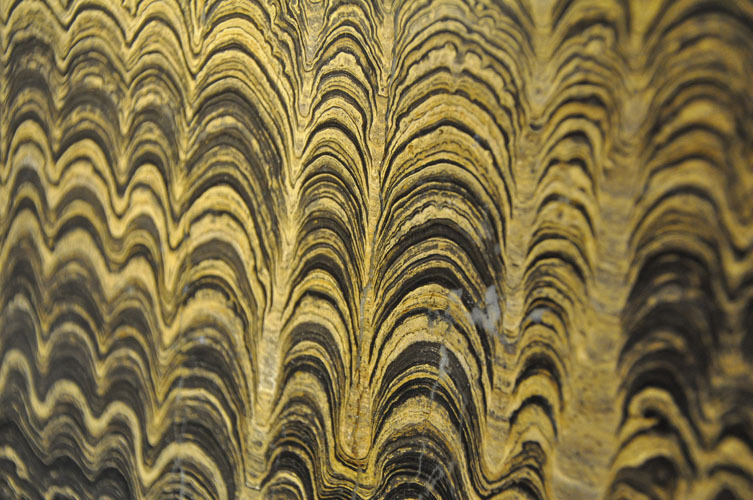 Stromatolite formed by layers of ancient bacteria preserved in rock. At least 3.4 billion years old. In another 3.4 billion years, the sun will be nearing the end of its life, having expanded into a red giant and swallowed Mercury and Venus. According to many estimations, by the time the sun is 7.59 billion years old, it will engulf the Earth. We are living in our planet’s middle age. It took half the Earth’s life for humanity to arise and build its cities. For the United States to claim its sovereignty. 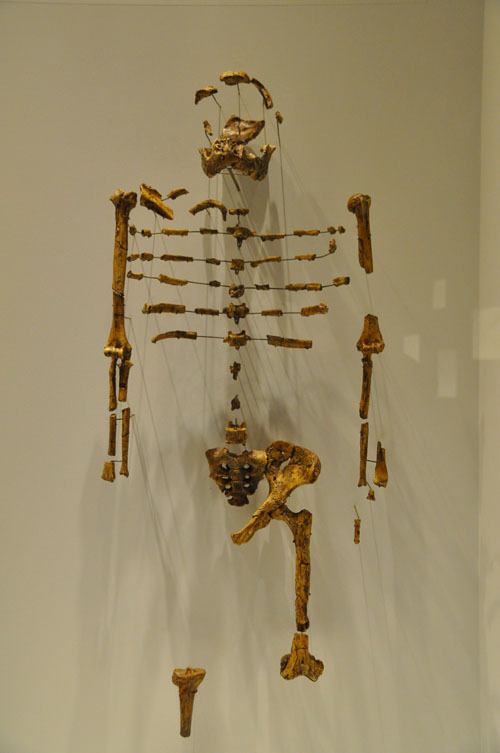 Lucy, Australopithecus afarensis, the most complete skeleton of this hominid in the world. 3.18 million years old. The Earth is old, dude! We never pay this age any mind until we identify something to date it against. Here we have Triceratops, say, a creature that lived in the time when this rock was young, just a pile of sediment on the floor of the ocean or a river. 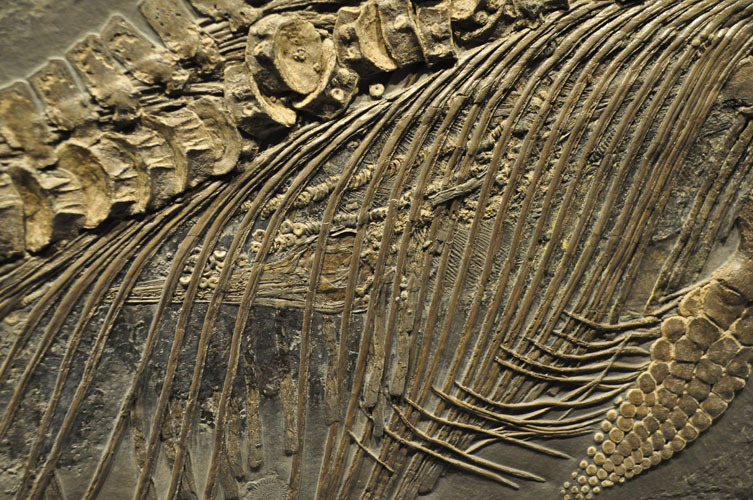 Paleontologists owe a lot to the power of speculation and theory. 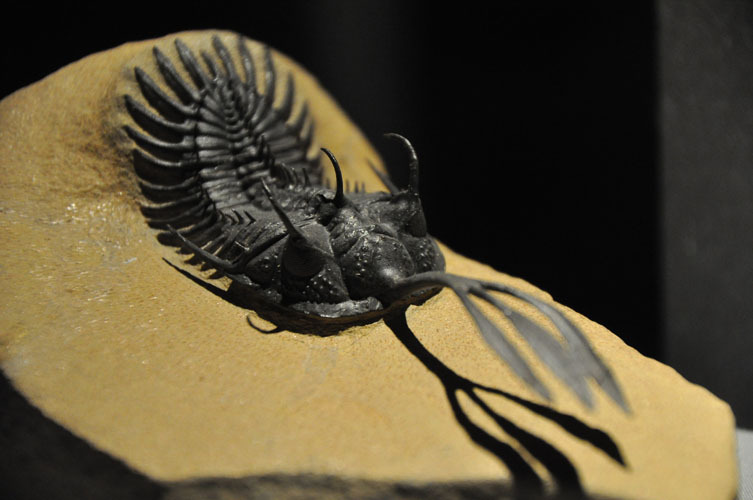 We may never know for sure what life was like in the era of these ancient creatures. But if we have anything in common with the dinosaurs, ancient mollusks and archaebacteria, it’s that we all grew on this same rock.